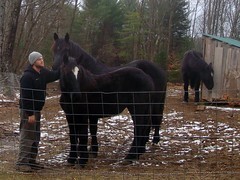 The horses needed a new bale today, leaving us only with three. Ella and the girl sheep will need one tomorrow, leave us only with two. The logger we used to clear the land this summer says he will “try to get to it this weekend” which is pulling it way too close for my liking. The amount of hay that we are going through is scary, actually. We are using the big round bales at the rate of probably three in a week with all of the critters. Probably more like three and a half. No one in New Hampshire could get us enough this year, so we are getting them from up on the Vermont/New York border, for $45 per bale for organic though not certified hay. The critters love it. It’s all second cut and lovely. I think Elly is getting fat on it alone, actually. It’s not wrapped really well, but our pretend round bale feeders of wrapping it in a cattle panel seems to be working out okay. Still. $500 a month in hay. Eep. We keep telling ourselves that next year will be better because they can browse on all the newly cut woods and we can fence and plant pasture as we can. It MUST get better, right? Right. It’s made us need to sell Polly, though. We are talking to a couple of people about her. We hate to see her go, but we just can’t afford a (cute! loving! adorable!) pasture ornament. This entry was posted in Hay. Bookmark the permalink. Post a comment or leave a trackback: Trackback URL.